Whether a transfer to and from the church, or a day of luxury and elegance, Chic Transportation INC can help you celebrate your daughter’s Quinceañera in style and comfort, let us help treat your beautiful Birthday girl like a queen! Chic Transportation INC offers an exquisite selection of Quinceañera Limos to choose from, our fleets choices and endless with latest model and style for you with your quinceanera date and your group of friends. You can choose from Lincoln stretch limousine, Chrysler 300 Limos, SUV stretch limousine, H2- Hummer or Cadillac Escalade limousine or our Party Buses, complementary non alcoholic beverage bar: soft drinks,sparkling cider and bottled waters for your group, and also red carpet service upon request if you’d like, make sure that everyone knows that it is your daughter’s special occasion. Nothing is as special as this Quniceanera day. For this reason Chic Transportation Inc is committed to making your Quniceanera limo rental as special and amazing as your princess imagined. 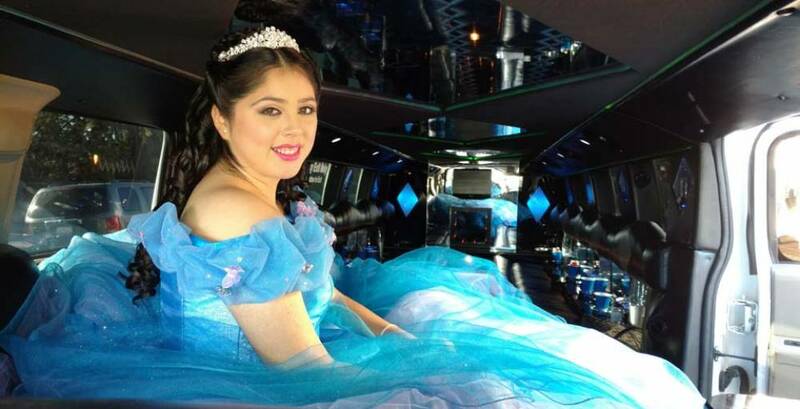 Chic Transportation INC should be your first choice of world-class Bay Area quinceanera limousine service provider, You can book online or call 1-800-550-5466 to reserve your Quinceañera Limousine service today!